Burdock root is an underground tuber of greater burdock plant that found its use as a vegetable and medicinal herb. The plant burdock is a short biennial which believed to be native to the Northern Europe and Siberia. In Japan, popular as gobo, it is being cultivated on a larger scale as a major root herb since earlier times. In the botany, however, burdock sighted as a wild, easy-growing, hardy plant existing in almost all parts of the planet. Botanically, burdock belongs to the family of Asteraceae; in the genus of Arctium, and known scientifically as Arctium lappa. Burdock roots. Note for woody, firm roots with crispy white color flesh. Greater burdock plant grows about a meter in height. Its broad, heart-shaped, coarse leaves feature deep-green on the top and light green on the underside similar to that of in rhubarb. In the summer, its thick hairy stems of about 5 feet in length bear red-purple tubular flowers, which subsequently develop into seed-heads or burrs with hooked spines. Close to its harvesting time, a deep taproot grows to a size measuring about 2-3 feet in length. It features thin, brownish root, similar in shape as that of carrot or parsnip. Burdock plant- Arctium lappa. Note for broad leaves and lavender color flower heads. Of the four species of Arctium, only greater burdock (A. lappa) and lesser burdock (A. minus) cultivated for their herbal parts. In general, its roots are unearthed in the fall, slow-dried and stored for use during the winter season. 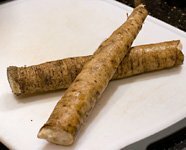 The burdock root has a flavor that closely resembles to the sweet taste of jerusalem artichokes or parsnips, and features crispy texture with a sticky consistency. Almost all the parts of the plant are being used either meant for culinary purpose or as a curative remedy for certain medical conditions. Burdock roots, young shoots, peeled stalks, and dried seeds carry numerous compounds that are known to have been anti-oxidant, disease preventing, and health promoting properties. The root is very low in calories; provide about 72 calories per 100 g. Burdock is a good source of non-starch polysaccharides such as inulin, glucoside-Lappin, mucilage, etc., that help act as a laxative. Additionally, inulin acts as prebiotic and helps reduce body weight, and the blood sugar and cholesterol levels in the blood. Burdock root is especially containing proper amounts of electrolyte potassium (308 mg or 6.5% of daily required levels per 100 g root) and low in sodium. Potassium is an important component of cell and body fluids that helps control heart rate and blood pressure. This herb root contains small quantities of many vital vitamins, including folic acid, riboflavin, pyridoxine, niacin, vitamin-E, and vitamin-C that is essential for optimum health. Both vitamin C and E are powerful natural antioxidants help the human body stave off infections, cancer, and neurologic conditions. Furthermore, it also contains some valuable minerals such as iron, manganese, magnesium; and small amounts of zinc, calcium, selenium, and phosphorus. Just like its fellow Asteraceae family member dandelion, almost all the parts of burdock herb too found a place in various traditional as well modern medicines. Burdock has been used in many folk remedies as one of the best blood purifiers. It contains certain diuretic principles, which help expel toxic products from the blood through urine. The herb employed in the treatment of skin problems such as eczema (dermatitis), psoriasis, skin dryness, etc. The plant parts have been used as an herbal remedy for liver and gallbladder problems. Effusion of burdock seeds has been used for throat and chest ailments. Burdock leaves and stems, in addition to their use as a vegetable, have appetite stimulant and are a good remedy for gas and indigestion (dyspeptic) complaints. In Japan, gobo soup is advocated to prevent cancer, cure diabetes, lower blood pressure and overcome hangovers. Burdock root (A. lappa),raw, Nutrition value per 100 g.
Burdock roots can be readily available in the Japanese supermarkets year around. However, in The USA, one may find dried roots only in selected vegetable markets or in some special oriental herb stores. In general, roots of about 2 feet long and about 1 inch in diameter kept in the markets for sale. Choose medium sized, firm, unbroken roots with taut skin. Avoid overly dry or sunken ones as they may be off flavored. Cleaned, dry root stay fresh for several months if kept in a cool well-ventilated place. You can also wrap it in a wet paper towel, seal in a plastic bag and store inside the refrigerate in the vegetable compartment for several months. If root becomes limp, soak in water until firm again. Processed parts/slices, however, should be kept in the refrigerator and used as early as possible. On the exterior, burdock root features dark brown "bark like" color and has a woody texture. Inside it features crunchy, milky-white fibrous flesh, which may turn gray upon exposure to air. To avoid this, drop burdock slices/pieces/julienne into lemon water to prevent oxidation. To prepare; wash the entire length of the taproot thoroughly in cold water and scrape off the outer skin using a paring knife. Burdock root is tough and should be tenderized before its use in cooking. To soften, cook the root in boiling water with a single teaspoonful of baking soda added to a liter of water. Thus, the prepared root is then can be eaten as is, or added to salads, soups, etc. Burdock root features in a variety of Japanese cooking. In general, it is used as a side dish, soups and as an appetizer. In Japan, gobo soup prepared with gobo, radishes, carrots and dried mushrooms, and readily available in the stores as canned stock. Cooked and sliced burdock can be enjoyed with butter and salt. Burdock easily mingles with carrots, onions, parsnips, mushrooms, etc., in kinpira style cuisine (kinpira gobo). Burdock chips prepared akin to potato, cassava, or plantain chips, are on of the favorite snacks. Young tender burdock shoots, harvested before flowering, used in salads or as a cooked vegetable. Burdock root can be safely used in healthy individuals without any reservations. However, in patients on potassium-sparing diuretic therapy, it may aggravate potassium toxicity. The whole plant may elicit allergic reactions in some sensitive individuals. (Medical disclaimer). <<-Back to Herbs from Burdock root. Visit here for an impressive list of all variety of herbs with complete illustrations of their nutrition facts and health benefits.